Older models not in contention for the lead, these Maseratis were still interesting and beautiful cars. 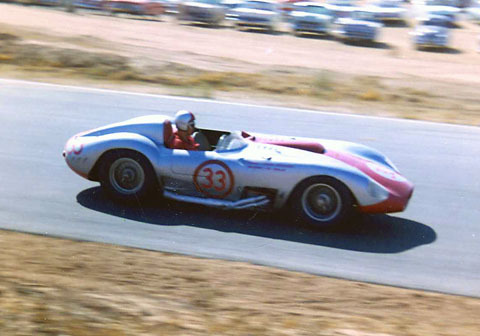 Chuck Kessinger, in Dr. Rey Martinez's ex-Tony Parravano Maserati 450S #4502 failed to qualify for the Oct. 14-15, 1961 Riverside GP. Bill Krause had some success earlier with this car. It can be glimpsed briefly in the Elvis Presley film "Viva Las Vegas". 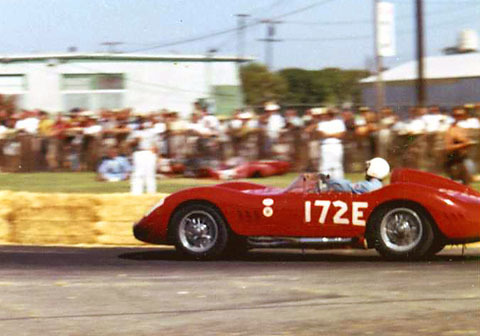 Ted Peterson at Pomona on July 9th, 1961 in his Maserati 150-S. This car had a 200S engine installed at the factory. 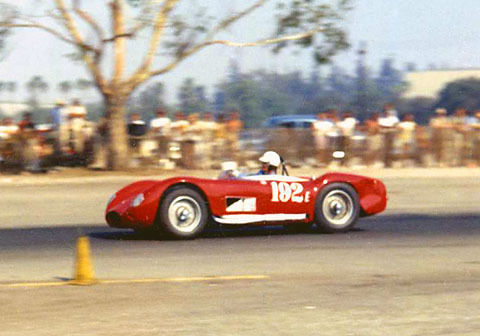 Seen here at Santa Barbara on Sept. 2-3, 1961, Steve Baughman qualified this Maserati 200-SI for the Riverside GP through the consolation race. He DNF'd after running last. In amateur racing, he and Peterson had some equally-matched battles.